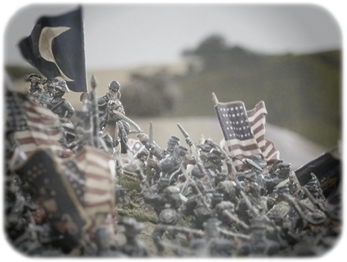 A set of medium to large scale wargames rules for the American Civil War period 1861 to 1865. Units are organised into Brigades and commanded at Divisional level for the Confederation and at Corp level for the Union. A very simple command ordering system allows a fast flowing game to unfold right before your eyes. This is achieved through a command structure where commanders must keep their troops motivated or their formation and army morale may crumble. Control of the battle is achieved through a series of morale checks; these are effortless and give extremely good historical results. You may find your units running for cover when you least desire it, then find that they return with a new resolve and vigour for the fight. These rules are capable of reproducing all the major battles of the American Civil War from Bull Run 21st July 1861 through to Parnetto Ranche 13th May 1865.